Well, as regular readers of this grumbling old blog will guess, I have a few other gripes to add to the list! Take this week for example. 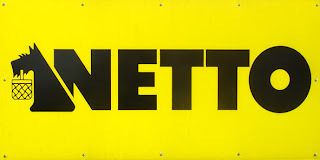 It has become clear to ASDA and Tesco that in the current economic climate the budget/discout supermarkets - Netto, Aldi and Lidl are increasing their market share. So what do the big boys do? They cynically plan widespread reductions in the cost of basic food items to combat the growing threat to their dominance. What I would ask is this - why did the buggers have to wait to slash costs? This can only mean that their margins were greedily too wide beforehand. They are like monsters chomping up the nation's wealth, killing high streets, providing people with corporate monster uniforms and terribly low pay. I don't know who worked this out but they say that for every seven pounds spent in the UK, £1 is spent at Tesco. That is a helluva lot of money - so who is benefiting from this monstrous profit-fest? Who are the people watching their supermarket-engendered incomes growing like rampant cornfields as they sit round distant swimming pools drinking pink champagne? If anyone knows the answer please tell me. 1) Psychological mind games - fresh fruit at the entrance, the smell of baking bread. 2) Loss leaders and "Buy One Get One Free" tricks to lull us into spending more money. 3) How their scanning or pricing errors are okay but a kid stealling a can of lager feels the full force of their legal wrath. 4) "Free" delivery services that those not using the delivery service actually pay for! 5) Very limited recycling facilities even though they are responsible for mountains of waste. 6) Occasional and very costly changes in corporate uniforms. Who pays for them? 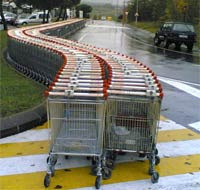 7) How they flout or stretch planning laws and ultimately kill off independent stores. 8) Extended opening times that mean workers must accept unsocial hours. 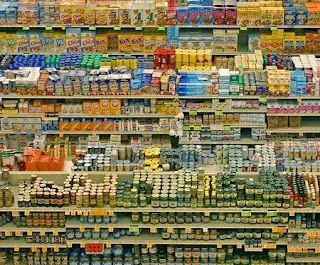 9) Mind boggling choice on the shelves - far too much choice in fact, leaving shoppers overwhelmed. 10) Bullying and exploitation of farmers and growers in the UK and across the world - to squeeze out maximum profits - no matter what the hurt or repercussions. At first I thought Hong Kong. Just £715 return with Qatar Airlines then £35 a night at the Silvermine Beach Hotel on Lantau Island. I had it all planned out - until that is I dipped into "The Rough Guide to Hong Kong and Macau". 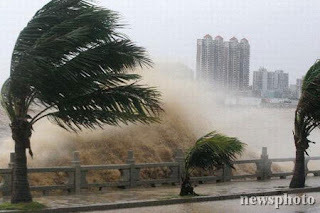 To paraphrase, it said that one would be advised to avoid visiting Hong Kong at the end of July through to mid-August because of heavy rainfall and the possibility of typhoons... So I have decided to give Hong Kong a miss. So where? Where? USA? We'll be going back when Frances spends a year at university there. Caribbean? Again that rain factor and besides Jamaica and The Dominican Republic sound risky. I have been just about everywhere in Europe and coastal Spain for example holds no sense of excited anticipation for me. Perhaps Sicily? Perhaps Turkey again - remembering the lovely holiday we had in Kalkan two years ago. I trawl the Internet for deals and I check out travellers' reviews in Trip Advisor. I seek maps and photographs. I find out what the beaches are like. Sandy or pebbly? Is air-conditioning included? Is airport transfer included? I tell you, I am a travel maniac and though I say it myself - rather wizard at finding flights, accommodation and exploring the fine details of resorts. I notice the time that a flight departs and when it returns as flight times in the middle of the night can sometimes really spoil your holiday experience. I wish you could do online degrees in tracking down great holidays because I'd win a first. It's much more fun than the daily grind of being a teacher - the books to mark, the assignments, the reports, the targets, the improvement plans - the crap! I'd rather be dreaming of the famous lagoon at Olu Deniz. I'm circling around like a harrier hawk. Beneath me I see Turunc and Side, Gokova and Kas, Fethiye and Olu Deniz. It hasn't always been like this. I remember our first excursions abroad as a young married couple. We were still paying for those trips six months later as we counted the pennies and struggled to pay phone bills, the mortgage, the credit card bill etc.. Now, if we wanted to we could go anywhere in the world. Does that make us rich? You know. I think it does. To be solvent and secure. So many people on this planet would give their eye teeth to be in our position. It's not really a dilemma after all. It's a bloody dream come true! One of my best friends has gone - Boris. He arrived as a stray at our back door - eight years ago - thin and bedraggled. Shirley took pity on him and fed him while I made a handbill for the local shops - "Found!" But nobody came and Boris was starting to explore our home. I really didn't want him. Having a cat can be a twenty year commitment but Boris had chosen us. I bought him a watertight kennel from "Pets R Us" or some such warehouse type place and as soon as it was in position, Boris crept in and fell asleep - knowing instinctively that it was for him. Boris would often wait for me as I returned from my occasional visits to the local pub. He would see me turning the corner then run in front before lying supine on the pavement to have his belly rubbed. And if I was working on this computer, he would often enter the room, miaow, prick his ears back and command that I followed him. If he went to the kitchen cupboard it meant he wanted feeding and if he went to the front door it meant he wanted out. He spent a lot of time out and about - patrolling his territory. Once Shirley blinked googgle-eyed when she saw him on a work colleague's street about a mile from our house. She called him over and stroked him. I envied his feline life - free to come and go - free food supplies - no work and no clock to watch - no fashion concerns and as much impregnation of the local tabbies as he could handle! I would sometimes see him waiting intelligently to cross roads but of course he was only a cat and in my heart I feel sure that he has met his end on a nearby road. I have looked for him and we have called constantly for him but I believe that Boris has well and truly gone. 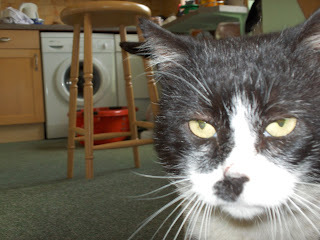 Just one little bit of hope resides in memories of our last cat - Blizzard - who died at the age of sixteen. Twice, he also disappeared and twice he returned several days after leaving. Where had he been? Of course he never told us. So please Boris! Come home! Daddy is waiting! We miss you! Mid to late June. Such a lovely time of year in the northern hemisphere - though last year this city I inhabit was struck by biblical style flooding around now. Not so this year. As the days and the weeks pass, it feels as if we are having a proper, sun-kissed summer - interspersed with acceptably short spells of wind and rain. In Endcliffe Park, the annual travelling fair didn't have to call in tractors to drag their sodden vehicles out of the mud and behind the school where I toil, the earth that the construction team pile into mounds is as dry as coffee granules. Last year, a natural swimming pool complete with muddy brown waterfalls formed over the emerging foundations of our new school. I love these summer skies, in a period when the darkness over Yorkshire lasts for little more than three hours a night. Every evening the sky is different - sometimes streaked with yellows, mauve, rose-pinks and gold but the sun rises so early I hardly ever see what's happening up there on the beautiful ever-changing natural canvas beneath which we mortals parade upon our ant heap of a planet. But just last weekend I greeted a summer 3.30 am dawn on the old bench at the bottom of our garden - mug of tea in hand and a rosy birdsinging glow from the east. Beautiful. See the sky beneath which bats weave and flutter and crows flap to their evening roosts. 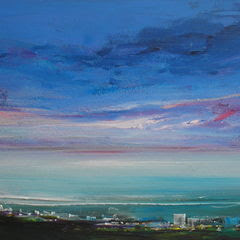 See the never-to-be-repeated patterns of light and colour, shadow and cloud. The gradual dying of the day - over silhouettes of rooftops and sycamores - a promise of something finer, brighter far to the west. Human beings have always looked up there - to the stars, the clouds, the blueness and the grey - the sky - silent and perpetual witness to a billion zillion ridiculously brief lives. Scientists believe that this planet has been in existence for 4.6 billion years. In only half of that time has there been a belt of oxygenated air that could sustain life. It seems that people have only been around for the last million years so if you took a twelve inch ruler and used it as a scale to represent the Earth's history, human life would only figure in the last measly millimetre. Now I am not a scientist but my researches suggest that there are many differing opinions about how oil ever came about in the first place and also about how far back on the Earth's massive timescale it was first formed. A majority of modern scientific observers cite the "diatom" as the basis of all oil formation. Think of ancient tropical seas and lakes. 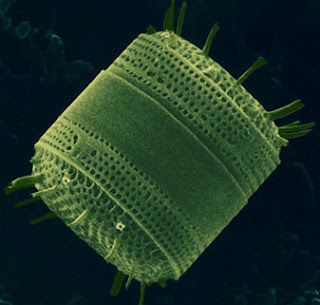 Under the hot sun a living soup forms - plankton and other basic life forms such as the diatom. This soup falls to the seabed and it falls again and again over millions of years. Sediments fall and they give a home to the oily broth of those billions of dead single-cell diatoms. Rocks form and the oil is trapped awaiting human discovery though some of it seeps to the surface. Estimations of how old the Earth's oil is vary betwen ten million and five hundred million years. Quite a lot of room for error! I have started to try to picture this ancient natural process when I use electricity. Upn deciding to switch a light off, don't think of the money you'll be saving, think instead of those pre-human seas and lakes with the sun beating down, long before dinosaurs, long before woodlice and certainly way long before the first primitive men said "Ug!" and beat their chests. Having oil and the petroleum and plastic products it has spawned is an amazing bounty for which we should all be incredibly grateful. Instead - what do we do? We squander this gift like children with Christmas selection boxes. Guzzling it down with no thought for tomorrow. Winnie on the riverbank watching the boats go by. Winnie sucking tea through a straw. 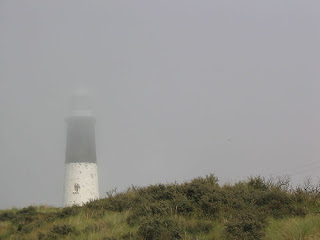 Photo - The lighthouse at Spurn Point. Nice word don't you think... pottering. And a much under-rated activity. I picked Ian and his girlfriend Ruby up from East Midlands airport at two in the morning and finally got to bed at four. I rose at ten, showered and spent much rest of the day just pottering around in the garden. It was a lovely blue sky day and as the afternoon proceeded, the temperature rose to 29 degrees centigrade according to my electronic thermometer - though this may have something to do with the fact that the outdoor sensor gets hit by direct sunlight. 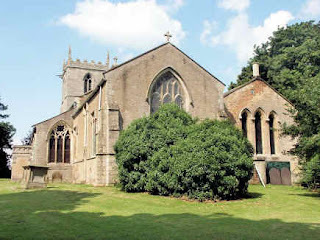 I lay prostrate on the grass and trimmed away at the corner where the wooden toadstool is and the shy little stone girl. I tugged away at grass stalks and clipped the invasive brambles. Nesting swallows made various journeys to the temporary home they have made under the eaves of next door's house while a mother wren fed her babies in the nesting box I screwed to a fence post a couple of years ago. You could see two tiny beaks at the little round hole, begging for life. A familiar robin cheekily landed on the giant sycamore shoot I was in the process of hacking down. He seemed to be watching me all through the afternoon, darting from lawn to apple bough, sipping at the bird bath, pecking at the niger seed feeder. At one, Shirley and I ate chicken biryani and nan bread on the deck when who should join us but Boris, returning from his feline morning patrol. I rubbed his belly and he sheltered in the shadow under our garden table. A veritable mountain of clippings and prunings, twigs and branches is building at the bottom of the garden. One of these nights I will be out there with matches, intent on arson. When you're pottering, time drifts by and you think lots of thoughts. They wash across your mind screen like random sea waves. It's therapeutic. And when you are pottering, it doesn't matter what you achieve or fail to achieve. There's no pressure. No big project. No deadline. Ian arrived for Sunday dinner and the three of us ate it on our sunny decking around six thirty. He'd been in Egypt for two weeks so I told him all about the Tigers' triumph at Wembley and Shirley told him about his grandmother's departure. We had insisted he should go ahead with his holiday come what may and he flew out to Sharm el Sheikh on the morning of May 24th just a couple of hours after Winnie passed away. And when Ian went back to his house, I continued to potter a little while longer as well as trying unsuccessfully to connect up the Orange Live Box to our computer. This piece of technological wizardry arrived through the post and is part of the deal when you switch phone and broadband provision from British Telecom to Orange. "No problem!" they assured me. I should have known better. ...Like most lives that are lived, hers was perhaps unspectacular but it was also a very decent life in which each day she lived and breathed the two things that really mattered to her – her family and her friends. She didn’t smoke or drink but sought to live healthily with dignity and self-respect, raising a family by the river bank as beyond it the Trent flowed on towards the Humber and the sea." Model with carving in the background. The Crazy Horse Memorial is a mountain monument in the Black Hills of South Dakota, in the form of Crazy Horse,an Oglala Lakota warrior, riding a horse and pointing into the distance. The memorial consists of the mountain carving (monument), the Indian Museum of North America, and the Native American Cultural Centre. The monument is being carved out of Thunderhead Mountain on land considered sacred by some Native Americans, between Custer and Hill City, roughly 8 miles (13 km) away from Mount Rushmore. The sculpture's final dimensions will be 641 feet (195 m) wide and 563 feet (172 m) high. The head of Crazy Horse will be 87 feet (27 m) high; by comparison, the heads of the four U.S. Presidents at Mt. Rushmore are each 60 feet (18 m) high.The monument has been in progress since 1948 and is still far from completion. If finished, it will be the world's largest sculpture. The mountain carving was begun in 1948 by sculptor Korczak Ziolkowski, who had worked on Mt. Rushmore under Gutzon Borglum. In 1939, Ziolkowski had received a letter from Chief Henry Standing Bear, which stated in part "My fellow chiefs and I would like the white man to know that the red man has great heroes, too." Ziolkowski died in 1982. 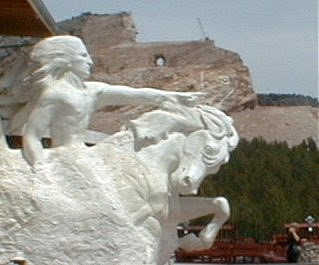 The entire complex is owned by the Crazy Horse Memorial Foundation. Ziolkowski's wife Ruth and several children remain closely involved with the work, which has no fixed completion date. 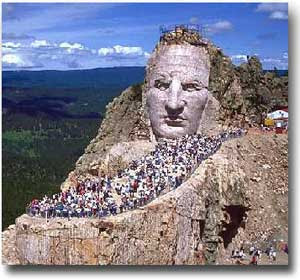 The face of Crazy Horse was completed and dedicated in 1998. 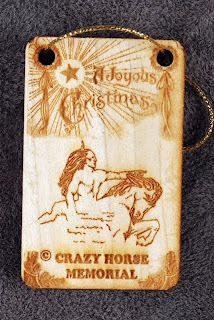 Even though it is far from complete the Crazy Horse carving has become the central focus of a lucrative tourist trade with some 1.2 million visitors arriving at the site each year. The Ziolkowski family continue to laugh all the way to the bank. How many more years before the carving is finished? Some say twenty five years, while others say - never!